You have decided to build a new barn with Durastall stables for your farm in the Perth area. You have learned how a barn made of BlueScope Steel from Action Sheds Australia can save you money while providing years of service. You already know that adequate ventilation is of paramount importance for the health of both you and your horses. But have you considered the lighting? You not only want your stables to be well-lit, but you also want the electrical systems that provide the lighting to be safe. One of the first considerations is that you should have plenty of windows to allow natural light. However, too many windows will make it too hot in the daytime and can affect the structural integrity of your barn, so be careful. It is also a good idea not to have direct sunlight going into the barn for a great period of time. Pointing the barn lengthwise to the north and south will ensure that the windows on the long walls won’t be facing the sun directly. This allows the light to come in but without creating extra heat or a fire hazard with the sun shining directly through onto hay or dangerous chemicals that may have been left laying around. Whenever possible, make sure you have an electrical panel in the barn that is large enough to handle your lighting, heating, cooling and any other electrical needs. When wiring your barn, make sure that all of the wiring is rodent proof. Use metal sheathed wire whenever possible. We recommend hiring a licensed electrician to ensure safety and compliance. There are many different options, but you should always remember to use cool burning lights, no matter which choice you make. Bulbs that create too much heat can be a fire hazard in barns or stables. Whenever possible, we recommend fluorescent lighting. The fixtures are also important. Make sure you buy commercial or agricultural grade fixtures. They stand up to temperature extremes better and are less likely to create a fire hazard. 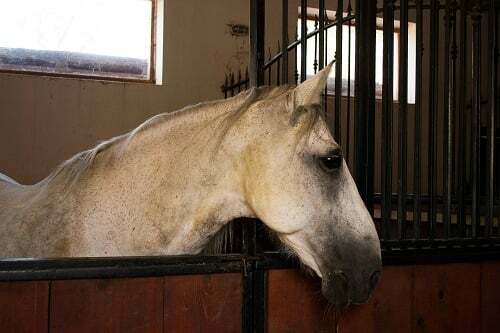 If you have any bulbs within reach of the horses, they should be covered and secured so that the horses can’t break the bulbs or hurt themselves. While many think cages are good enough, they don’t keep glass shards from falling into the stable if they do happen to break. We recommend shatterproof lenses. This also prevents cobwebs, chaff or other various forms of debris from accumulating on the bulb and catching fire. All switches should be built to industrial standards and out of the reach of the horses. Outlets, switches and fixtures should be moisture proof. If you have a light fixture in a stall, make sure the horses can’t hit their heads on it. Lights should be bright enough to see and eliminate shadows but should never cause glare. Be sure to remember exterior lighting by all entrances. It isn’t a bad idea to have exterior lights all around your stables for security reasons, either. If you want to save power and don’t want a lot of light, you can always put a light by the entrance with a motion sensor that turns it on when you approach the door. That makes it easy for you to find your keys and enter. It is also a great idea to place your switches near the entrances so you don’t have to fumble around in the dark trying to turn on the lights. At Action Sheds Australia, all it takes is one phone call and we can start designing your stable complex. We can ship the parts to you in modular form to install on your own or we can handle the entire process of selecting, building and erecting your stables ourselves. We use BlueScope steel and offer a ten year structural guarantee in addition to a fifteen year warranty on the cladding. In addition, all of our sheds are ShedSafe certified. Call Action Sheds Australia today for a free quote: 1300 778 628.